The Grand Fiesta Americana Coral Beach Cancun is a luxury resort that truly represents vacationing in VIP style. This top Mexico property is your gateway to the bustling area of Cancun and all the city and surrounding area has to offer. Cancun is a popular tourist destination all yearlong. It offers travelers beautiful turquoise water, about 14 miles white sand beaches, great Mexican cuisine, and a thriving nightlife. Explore the Mecican Yucatan Peninsula. 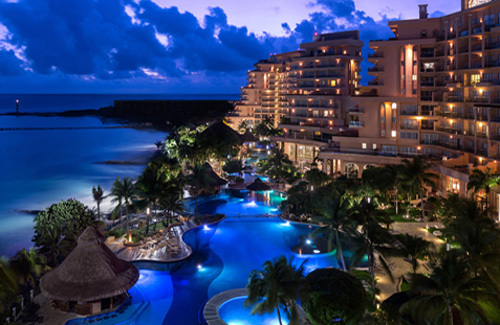 But for a rewarding VIP experience at a top luxury resort, stay at the Grand Fiesta Americana Coral Beach Cancun. The luxury property offers 602 all-suite ocean front accommodations. Each suite includes a private terrace that directly faces the Caribbean Sea and a gorgeous lagoon-like pool. For a VIP style stay at the Grand Fiesta Americana Coral Beach Cancun, be sure to try one of the resort’s or nearby luxury experiences. Get pampered with one of the luxury spa treatments at the award-winning Coral Beach Gem Spa. Get a massage or facial treatments that integrates dust that was made from actual diamond crystals. For example, the spa’s Diamond Dust Body Exfoliation and Massage uses a mud masque that’s applied to the client’s skin. Once the masque is removed, receive a relaxing, magnetic body massage. Next you get a tension-relief massage to take away your body’s aches and pains. What a VIP experience! Your skin will look and feel revitalized and your body will be ready to enjoy the rest of your vacation. Be sure to explore the local Cancun area and enjoy the ancient ruins. First visit the Maya Museum (Museo Maya de Cancun) to learn about the history of the ancient Mayan civilization. Nearby is a historical archeological site named San Miguilito. This place dates back to 1250-1550 AD. You’ll discover several pyramids and other primeval structures. You can almost imagine what it was like back in the height of the Mayan civilization by walking along the ancient paths. There are also three exhibit halls to view various archeology, mosaics and other ancient Mayan artifacts. It’s a very rewarding experience and an insight into ancient history. For an outstanding dining experience, enjoy a meal at La Joya Restaurant. As the authentic Mexican restaurant of Grand Fiesta Americana Coral Beach Cancun, resort guests can dine to delicious Mexican cuisine. Tequila is the national spirit of Mexico. Be sure to try the restaurant’s 3-tiered tasting offer. First learn more about the history of tequila and how it’s made. Then sample Blanco with a hint of salt and lime wedge. Next it’s Reposado and served with a drink of “sangrita.” This classic Mexican accompaniment is incredible. Last, Añejo Tequila which has a bit of a spicy taste. The luxury Grand Fiesta Americana Coral Beach Cancun resort is the perfect place for a one-of-a-kind getaway. Be sure to also stop by the resort’s Grand Club. It takes up the top two floors and features luxury services and amenities. There’s a pool, dedicated lounge and even 24-hour concierge service. Live it up VIP style! If you have been considering a vacation to Cancun, Mexico, then be sure to stay at the Grand Fiesta Americana Coral Beach Cancun resort. Contact us for help booking your luxury travel reservation. Come back again to read this luxury blog for other top destinations around the world. Live a life of luxury!